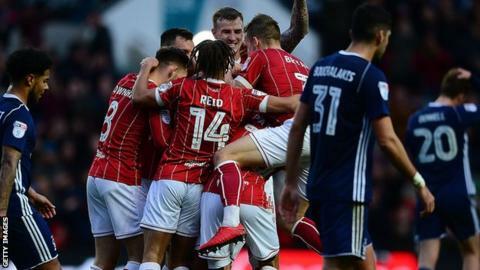 Bristol City continued their impressive form with a hard-fought home victory over Nottingham Forest, their fourth successive Championship win. Marlon Pack's 20-yard strike, his first goal of the season, and Joe Bryan's deflected effort put City 2-0 up. Tyler Walker came close to equalising, but the Robins held on to remain four points off second-placed Cardiff City. Lee Johnson's side, who face Manchester United in the Carabao Cup quarter-finals on Wednesday, have now won eight of their past 10 games in all competitions. Having controlled large parts of the first period, they were made to work hard for their victory after Dowell's eighth of the season made it 2-1. Walker saw his attempt from inside the area diverted just wide, before Ben Osborn drilled narrowly over the bar from the edge of the box. But Forest, who remain seven points outside the top six, were unable to find a second goal, meaning they have still not drawn a match this season. Bristol City's players and staff dedicated their 2-1 victory over Nottingham Forest to the family of eight-year-old Robins fan Ben Pritchard, who died from a brain tumour last month. "We deserved to win the game and can now go into the Carabao Cup quarter-final with Manchester United full of confidence. "Ever since the draw was made people have been wanting to know about that game. But we had a lot of important league fixtures in between and the lads have done really well to concentrate on each one. "Now we can actually concentrate all our efforts on the tremendous challenge of trying to beat a fantastic team." "We were 2-0 down because we didn't create chances and didn't look after the football well enough. ''I just thought we showed real energy in the second half. We have a really good, young, hungry squad. ''With Ben Osborn to come on and play in that manner speaks wonders about his quality." Match ends, Bristol City 2, Nottingham Forest 1. Second Half ends, Bristol City 2, Nottingham Forest 1. Foul by Zach Clough (Nottingham Forest). Korey Smith (Bristol City) wins a free kick on the right wing. Cauley Woodrow (Bristol City) is shown the yellow card. Matty Taylor (Bristol City) wins a free kick in the attacking half. Substitution, Bristol City. Cauley Woodrow replaces Bobby Reid. Attempt missed. Zach Clough (Nottingham Forest) right footed shot from outside the box is close, but misses to the right. Assisted by Ben Brereton. Attempt blocked. Joe Bryan (Bristol City) left footed shot from outside the box is blocked. Assisted by Josh Brownhill. Attempt saved. Matty Taylor (Bristol City) right footed shot from the right side of the box is saved in the bottom left corner. Assisted by Bobby Reid. Foul by Ben Brereton (Nottingham Forest). Aden Flint (Bristol City) wins a free kick on the right wing. Joe Worrall (Nottingham Forest) is shown the yellow card for a bad foul. Foul by Joe Worrall (Nottingham Forest). Joe Bryan (Bristol City) wins a free kick in the defensive half. Offside, Bristol City. Korey Smith tries a through ball, but Josh Brownhill is caught offside. Attempt missed. Joe Bryan (Bristol City) left footed shot from the left side of the box misses to the left. Assisted by Josh Brownhill with a cross. Attempt missed. Nathan Baker (Bristol City) left footed shot from outside the box is high and wide to the left. Offside, Nottingham Forest. Michael Mancienne tries a through ball, but Tyler Walker is caught offside. Substitution, Nottingham Forest. Ben Brereton replaces Mustapha Carayol. Substitution, Bristol City. Matty Taylor replaces Jamie Paterson. Attempt missed. Ben Osborn (Nottingham Forest) left footed shot from outside the box is too high. Assisted by Zach Clough following a corner. Attempt blocked. Tyler Walker (Nottingham Forest) right footed shot from the centre of the box is blocked. Assisted by Liam Bridcutt with a cross. Attempt missed. Jamie Paterson (Bristol City) right footed shot from more than 35 yards misses to the left. Attempt saved. Mustapha Carayol (Nottingham Forest) right footed shot from outside the box is saved in the bottom right corner. Assisted by Ben Osborn. Corner, Nottingham Forest. Conceded by Joe Bryan. Liam Bridcutt (Nottingham Forest) is shown the yellow card for a bad foul. Josh Brownhill (Bristol City) wins a free kick in the defensive half. Foul by Liam Bridcutt (Nottingham Forest). Substitution, Nottingham Forest. Zach Clough replaces Andreas Bouchalakis. Foul by Mustapha Carayol (Nottingham Forest). Attempt missed. Hördur Bjorgvin Magnusson (Bristol City) left footed shot from the left side of the box misses to the right. Attempt missed. Mustapha Carayol (Nottingham Forest) right footed shot from long range on the left is high and wide to the right. Assisted by Ben Osborn. Bailey Wright (Bristol City) wins a free kick in the defensive half.